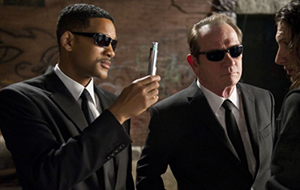 We've added Sony's Men In Black 3 and WB's Chernobyl Diaries to our Long Range Forecast this week. Both films are scheduled to open on May 25 ahead of Memorial Day. Historically, the four-day holiday weekend has been one of the busiest frames of any year (and often record-breaking). Among the best four-day Memorial weekend openings are franchise regulars Pirates of the Caribbean: At World's End ($139.8 million), Indiana Jones and the Kingdom of the Crystal Skull ($126.9 million), and last year's The Hangover Part II ($103.4 million). - Assuming neither Battleship nor Dark Shadows breaks out, The Avengers will be the only other May release over $150 million. By May standards, that leaves plenty of room for MIB3 among casual moviegoers. - The first trailer grabbed over 27,000 tweets in December. Only The Dark Knight Rises and The Avengers have had bigger trailer debuts among the Summer films. - Will Smith is still one of the biggest and most reliable box office draws in the industry, which is a huge plus going into a lucrative holiday weekend. - Negative buzz around the film's script issues and budget has created some concern. - Despite a decent box office run at the time, the 2002 sequel wasn't nearly as well-received (critically or commercially) as the first film. Maybe the long wait will help some people forget about it. - Franchises tend to decline in ticket sales as they go deeper into sequels, especially when those sequels disappoint their audience and don't live up to the original's box office standards. One appropriate comparison may be Pirates of the Caribbean, of which last year's fourth entry saw a significant drop in ticket sales from 2007's Pirates 3 despite retaining its leading star and adding 3D into the mix. - The lack of direct genre competition plus the holiday opening should help. - Big openings are driven by trending and viral buzz. Given the scant slate for horrors and the pedigree of the filmmaker, Oren Peli (Paranormal Activity), this could be a good foil for Men In Black 3 ... but it has a long way to go to get there. - The trailer snagged only 800 tweets. By comparison, The Devil Inside had just under 2,000. The Darkest Hour had 578. - Horrors have tended to only peak on Twitter closer to their release when late night commercials begin.